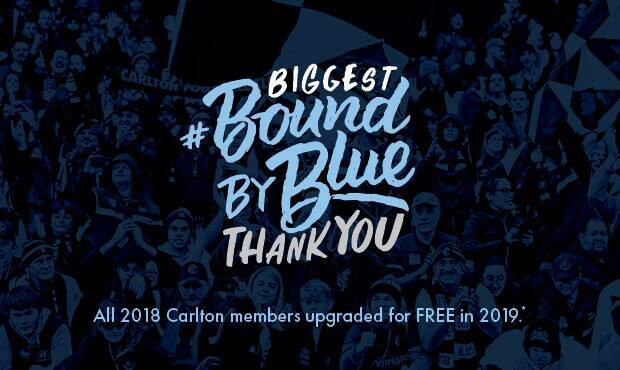 Touted as the Club’s Biggest #BoundByBlue Thank You, all 2018 Carlton members will be upgraded FREE in 2019. Honouring your passion for the Old Dark Navy Blue is of utmost importance to the Club, and this heartfelt thank-you goes to every member who sat in the stands, waved a flag, cheered us on, watched on TV or simply bought a membership to support the Blues this season. CEO Cain Liddle said this campaign was all about recognising and rewarding Carlton’s loyal members. “We know this year has been challenging, so we wanted to genuinely thank each and every member who has supported us throughout the season,” Liddle said. “It’s important our members know how much they mean to us and that their commitment to our long-term plan is greatly appreciated. Carlton’s Biggest #BoundByBlue Thank You coincides with Member Appreciation Round, taking place across the AFL this week. Stay tuned to Carlton Media over the coming months via carltonfc.com.au for more details regarding our Biggest #BoundByBlue Thank You. You will also receive information about your FREE upgrade in your membership renewal pack. Members on Carlton Direct will have theirs distributed in September, while all other packs will be issued in late October. *To receive the free upgrade, members need to renew their 2018 Carlton membership before Thursday 31 January 2019 and sign up to the Carlton Direct payment option^. Why is Carlton upgrading everyone’s membership? To sincerely thank its 2018 members for their loyalty, dedication and support throughout this season. What is my complimentary upgrade? You will be notified of your complimentary upgrade on your 2019 membership renewal form which you will receive in September (Carlton Direct) or October (all other members) 2018. What will my membership cost be? You will pay for the same membership package you purchased in 2018. The upgrade component will be given to you FREE as a thank-you for your support. I already have the most premium membership, will I still receive an upgrade? We have assessed each membership type to ensure every member receives a complimentary upgrade irrespective of membership category or entitlements. More details will be provided on your renewal form which you will receive in September (Carlton Direct) or October (all other members) 2018. Do I still get an upgrade even though I am an international/interstate member and can’t get to any games? Yes, you will still receive a complimentary upgrade. More details will be provided on your 2019 membership renewal forms. Are AFL Club Support members included? Yes – AFL and MCC Support members will receive an upgrade. Stay tuned for more information. By when do I need to renew my 2019 membership to ensure I receive the complimentary upgrade? You will need to renew your membership by Thursday 31 January 2019 to get your complimentary upgrade. How can I set up Carlton Direct if I’m not on it already to ensure I receive my free upgrade? Contact our membership team on 1300 227 586 or email membership@carltonfc.com.au and we’ll help set you up. Term/condition: Must renew your 2019 membership by 11:59pm AEST January 31 2019.